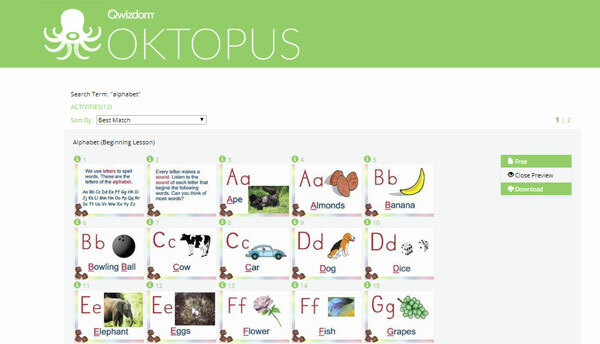 For this month’s blog I wanted to give you some ideas on how you can use Qwizdom Oktopus with your Preschool – 4 Grade students. Did you know that there are free activities available online? I will walk you through how to download and edit these premade lessons. I also created a couple fun, sample lessons for Kindergarten and Preschool students that include songs, counting and reading practice. Last but not least, I created a 4th Grade Math Lesson that lets students practice identifying triangles. There are free Math, Science and Language Arts lessons available online. The majority of activities are geared towards Kindergarten – 5 but some can be used for Preschool too. To access these lessons, follow the instructions below. Step 1: Create a free online account. Open Oktopus, go to the Settings / Login To My Account. If you have a product key, click Yes and enter your key, if not, click No. Re-open Oktopus, go to Settings / Login To My Account. Enter username (email) and password setup in registration. Check the ‘Save Credentials box. Now that you created an account and are logged in, go to the ‘Lessons’ tab and select the Lessons Search icon. Grade, Subject and then click ‘Go’. Premium Content (which requires a Blend subscription). Use the page numbers to scroll to the free content. browse to the newly downloaded activity (.qap). I downloaded an Alphabet lesson and then added some interactive slides to the end of the activity so students can practice their ABCs. Such activities include building words and matching. For preschool, you could use Oktopus to bring your circle-time songs to life or create simple interactive games. I created a short lesson that includes ‘There Was an Old Lady, 5 Little Monkeys, Frog Counting Game’ and more. Click on the link below to download the activity and add your favorite circle time songs and activities. You could use Oktopus as a way to start the day. You could have students check in, add dates, report the weather, practice the days of the week and learn about seasons. Here is a lesson that you can download and modify to work with your morning routine. Here is a fun lesson where students can measure angles and sides of a triangle using a protractor and ruler to identify the triangle. What types of activities have you created? Do you want to share your work? Email info@qwizdom.com your favorite Oktopus activity or share it on Facebook or Twitter. Don’t forget to tag #Qwizdom #QwizdomOktopus. Happy teaching everyone!